The Eco-Line product is a high quality aluminum alloy tubing and engineering grade plastic and brass fitting that provide an efficient, lightweight, flexible and easy to install system. With just a standard tubing cutter any type of system can be installed. Whether it's a simple straight run to the most complex of installations, Eco-Line will prove to be the easiest system on the market to install. Simple push fit connection. From receiver, throughout entire distribution system. Quick, easy to install and modify thus it reduces production downtime. SynergAir tubing/piping is manufactured from marine grade aluminum (6063 T4) to ensure the highest quality levels and outstanding performance when accompanied by our engineered range of fittings. Aluminum air systems have rapidly increased in popularity due to the non-corrosive nature of the systems – meaning performance levels remain constant and downstream componentry is protected from contaminants. In addition, the extremely lightweight nature of the product (as low as 0.1 LBS per foot) means it is easy to handle and fast to install. Tubes are supplied in 16 feet lengths for convenience in shipping and installation, but can also be ordered in 8 feet lengths for overnight shipping. When cutting the tubing, just a standard tube cutter is required to make the cut and then the ends should be ‘deburred’ on the outside to avoid any damaged to o-rings when attaching a fitting. 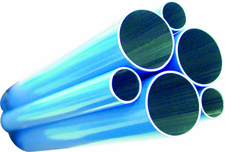 All tubes are externally powder coated in blue to provide further protection and easy facility identification. The push-in fitting has a collet (gripper) with stainless steel teeth that hold thepipe firmly in position and an o-ring to provide a permanent leak free seal. Fittings are manufactured from either engineered plastic or brass material and are specifically designed for use with SynergAir’s aluminum tubing. Connections are made with a simple push-fit action are immediately available for use. Complex systems can be assembled much more rapidly than with traditional methods and because fittings are easy to disconnect, systems can be altered or expanded with greatly reduced production down time. Synerg Air's standard industrial type, quick couplers widely used to connect tools and compressed air hoses are anything but standard. They feature a smooth acting, leak-free, 4 ball bearing design, with a corrosion resistant marine brass and nickel plating. 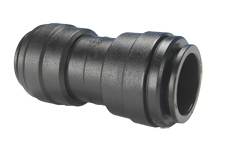 The spring loaded sleeve is automatically retracted when pushing a mating plug end into the connection socket. This makes tool and hose connection a one handed task. The sleeve must be manually retracted for safety, preventing accidental disconnection. Knurling and/or grooves on the sleeve provide a gripping surface for ease of operation. SynergAir mounting brackets are made from engineered plastic and are designed for ‘quick-snap’ capture of the tubing and easy wall mounting through a single bolt position. For situations where additional space is required between the wall and the mounting point, we offer a ‘spacer’ which has a matching bolt point and conveniently connects to the base of our mounting bracket with a push fit. The SynergAir Eco-Line has been designed to offer maximum flexibility in system scope, coupled with the ability to minimize complexity and inventory holding part numbers. 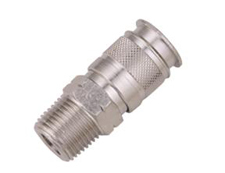 One of the key fittings that offer this flexibility are our stem adapters, which when combined with certain standard fittings can create new options in both tube to tube or threaded adaption. The stem adapter range includes both engineered plastic and brass fittings, which follow the same push-fit technology as standard fittings. 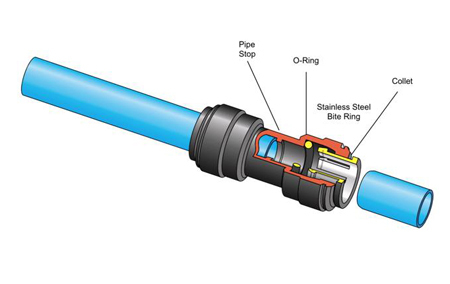 The stem is a male tube substitute which is inserted into the standard fitting. 6 months guarantee on parts against any manufacture defect from time of purchase. SynergAir does not accept returned inventory unless due to an error or omission by their company. Fittings and pipe should be clean and undamaged before use. 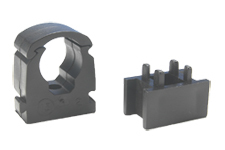 With the fitting clean and undamaged and the tubing cut square, you are now ready to make the connection. Push the tube into the fitting up to the pipe stop. The collet (gripper) has stainless steel teeth that hold the tubing firmly in position while the o-ring provides a permanent leak-proof seal. Pull on the tubing to check it is secure. It is na requirement that the system be tested prior to leaving the site and/or using the system. 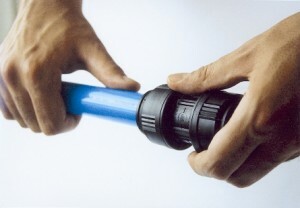 To disconnect, ensure the system is depressurized before removing the fitting. Push in collet squarely against face of fitting. With the collet held in this position, the pipe can be removed. The fitting can then be reused.